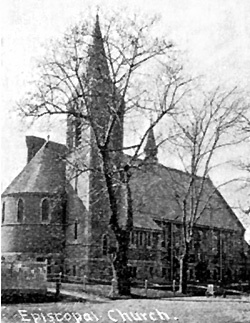 The late-Victorian Gothic Chapel of the Good Shepherd, opened on February 9, 1889, was an $85,000 gift from George Bliss to the New York Episcopal Mission Society. The chapel originally served as a place of worship for patients of the adjacent Blackwell's Island Almshouse. Male and female patients filed into the chapel separately through the two doorways into a space seating 400. The lower level held the island's first library, a room for Mission Society workers, and a robing room for clergy. Good Shepherd Chapel was designed by British ecclesiastical architect Frederick Clarke Withers, one of the first members of the American Institute of Architects. Withers also designed Strecker Laboratory at the island's southern tip, and his best-known New York City work is Greenwich Village's Jefferson Market Courthouse, now a public library. He considered the Gothic style ideal for churches. At the same time, he strongly advocated subtle combination of colors and materials. This is evidenced by the mixed shades of brick covering the chapel's exterior walls, the brownstone window enframements, the gray gneiss foundation, and the five-toned brass bell, which used to wake and beckon Almshouse patients and now sits in the surrounding plaza. The result is an imposing chapel that nevertheless maintains a restrained appearance, appropriate for its originally charitable purpose. 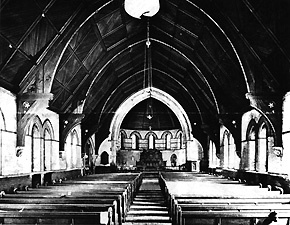 Interior of chapel before removal of pews, 1974. Though somewhat reminiscent of English parish churches, Good Shepherd Chapel was so unique that in its first year, it attracted over 2,000 visitors from Europe, Australia, and across the U.S. When chapels opened within Goldwater (1939) and Coler (1952) Hospitals, Good Shepherd Chapel fell into disuse and was closed in 1958. It was given new life in 1975 by becoming a designated city landmark, being restored by Giorgio Cavaglieri, and reopening as Good Shepherd Community Ecumenical Center. Designed by Johansen & Bhavnani, the surrounding Good Shepherd Plaza retains several of the chapel's neighboring trees, while harmonizing it with the surrounding residential complexes. The chapel's central location has made it a regular host of religious, governmental, and social functions. In this space, the island's Catholic and Protestant congregations worship, town meetings are held, and instrumental groups perform. Community groups (like the Roosevelt Island Residents Association) and various support and spiritual groups gather in the chapel. A homeless shelter has operated on the lower level.